your kids will thank you for. It's hard to find a gummy that can be considered healthy. Worst of all, sometimes healthy doesn't taste so good to kids. 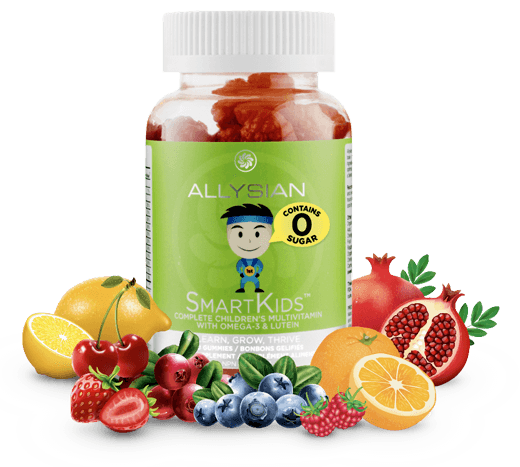 We've solved that with Allysian SmartKids™ by moving past what we thought was possible and creating a premium quality, full spectrum multi-vitamin gummy. It starts with the highest quality pectin and all natural ingredients. We go further by adding an organic base of fruit extracts that include many necessary phytonutrients and cofactors that are important for full nutrient and vitamin absorption. SmartKids™ is plant based, contains no artificial preservatives, additives, colour, or sweeteners and is free of most common allergens. More importantly, we made sure that it came in flavors that both kids and adults will love. Includes Meg-3® Omega-3 and Lutein! Certified organic food blend: inulin syrup, inulin powder, purified water, pectin, citric acid, sodium citrate, natural flavors (strawberry, orange), natural colours (black carrot, annatto), organic fruit powder blend (organic strawberry, organic raspberry, organic blueberry, organic tart cherry, organic pomegranate, organic cranberry, organic orange, organic lemon), vegetable oil (coconut), carnuba wax. Recommended dosage: Adults, adolescents, and children 4 years and over: Chew 1-2 gummies daily. Take a few hours before or after taking other medications. Store in a cool dry place. "Thoughtfully crafted by putting children's health first."